We are a progressive firm of accountants in the northern suburbs of Hobart. Our motto is "Speak no evil, see no evil, hear no evil and do no evil." The Toshogu Shrine in Nikko, honours the spirit of Ieyasu Tokugawa, one of Japan's most famous leaders. Many of Japan's leading craftsmen and artists were brought together to create this remarkable shrine which was completed in 1636. 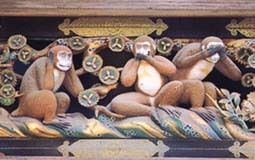 Jingoro Hidari, a famous artist and craftsman involved in many mysterious legends is reputed to have created the famous three wise monkeys. The three wise monkeys (Japanese: san'en or sanzaru, or sanbiki no saru, literally "three monkeys") are a pictorial maxim (saying). Together they express the idea to: "Speak no evil, see no evil and to hear no evil." John Harrison Accountants adopted what the three wise monkeys stand for as their motto many years ago. There is a fourth monkey called Shizaru that symbolizes the principle of "do no evil". This monkey is not often seen in western culture and usually shown covering its abdomen or genital area, or crossing its arms. In 2012 we decided to add what the fourth monkey stands for to our motto and all four will increasingly be seen promoting our services! Accounting is always a hard sell. A loss means that a client cannot borrow money, a profit and that the client will pay tax. At John Harrison Accountants we try and look for other ways of adding value, like saving you money! Whether we succeed or not we do a good job at a reasonable price. 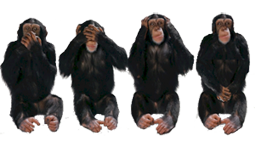 Just ask the wise monkeys! Our principal John Harrison is a scientist, economist and fellow of the Australian Society of Certified Practicing Accountants and Institute of Public Accountants with well over 45 years of accounting experience. We will take on most work from the simple to the complex so if you can't find somebody to do what you want - come and see us, you will be surprised what talent we can muster! Our office is conveniently located on the main road on the Glenorchy/Montrose boundary and you will have no problems parking. We occupy a large old stone building with a portico out the front. It has spacious rooms that have been converted into modern professional rooms. If you wish to engage us it is important that you read and sign our terms of engagement.